This is one of those questions that only the truest of procedural nerds can love. Say you commenced a case. You think it’s a really good case. But you decide that you want to move on and pursue other matters, even though it is a good case. The CPLR says you can discontinue your case without anyone’s consent if you do it early enough. 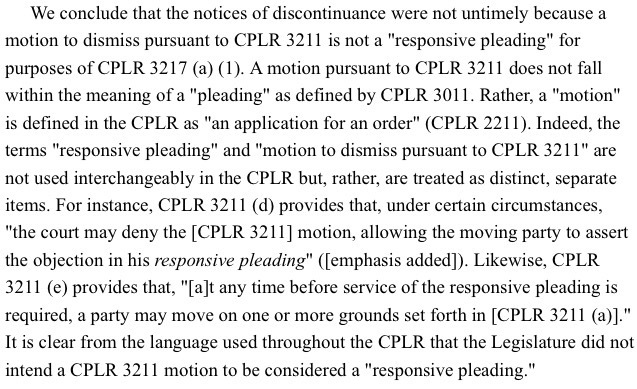 Particularly, CPLR 3217(a)(1) says you can voluntarily discontinue your case without seeking the other side’s or the Court’s approval by serving a simple notice “at any time before a responsive pleading is served.” But the question then becomes, what is a responsive pleading? The First Department has held that once the opposing party either answers or moves to dismiss the case, the right to voluntarily discontinue the action by simple notice disappears (see BDO USA, LLP v. Phoenix Four, Inc., 113 AD3d 507, 511 [1st Dept 2014]). The First Department reasoned, “if a motion to dismiss is not a ‘responsive pleading’ within the meaning of CPLR 3217(a)(1), a plaintiff would be able to freely discontinue its action without prejudice solely to avoid a potentially adverse decision on a pending dismissal motion. This Court has made clear that such conduct is improper” (id.). This view finds support in Professor Siegel’s Practice Commentaries, which note: “[t]he defendant who has moved to dismiss under CPLR 3211 has already done as much in the litigation (and more) than if she had merely answered the complaint” (Siegel, Practice Commentaries, McKinney’s Cons Laws of NY, Book 7B, CPLR C3217:8). The Fourth Department, however, now disagrees, creating a clear conflict between the Departments on the point. In Harris v Ward Greenberg Heller & Reidy LLP, decided June 16, 2017, the Fourth Department in a lengthy review of CPLR 3217 held that a notice of voluntary discontinuance served after a motion to dismiss was still timely because, simply put, a motion to dismiss is not a “responsive pleading” under the statute. 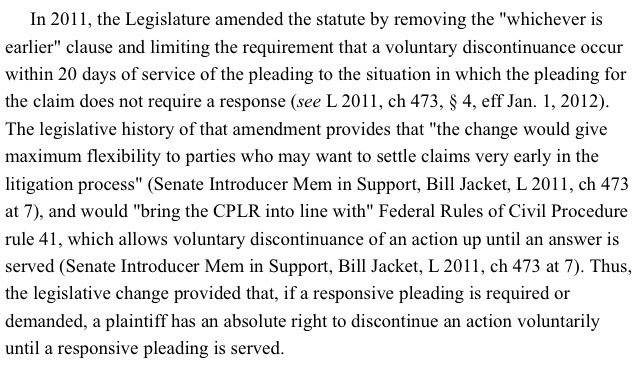 The Court reasoned, the CPLR does not treat a CPLR 3211 motion as a pleading for other purposes, so it shouldn’t be one for purposes of a voluntary discontinuance either. The Court further held that the legislative history underlying a 2011 amendment to CPLR 3217 supported the view that a case may be voluntarily discontinued by simple notice up until an answer is filed. Had the Legislature intended a motion to dismiss to terminate the right to discontinue a case by notice, it would have said so, the Court held. And so, the Fourth Department rejected the First Department’s rule and created an express conflict that will at some point need to be addressed by the Court of Appeals. Personally, I think that the Fourth Department’s textual analysis is stronger than the First Department’s rule, which seems more based on the practicalities of litigation than on the language of the statute. We’ll see if the Court of Appeals agrees when it eventually decides the issue. The Fourth Department’s order can be found here.